Hanover, NH – On Saturday evening, under the lights at Scully-Fahey field, the DRFC outscored Penn 38-0 in the Ivy XVs semi-finals to set up next Saturday’s final against Ivy North rival Harvard. The Crimson, victors over Cornell in their semi-final, will travel to Hanover for the Saturday, April 5th contest. While the first XV was taking care of business in Hanover, Dartmouth also sent a sevens team to Springfield, Massachusetts to compete along with fifteen other schools in the Armory Collegiate 7s Tournament. After a tough start losing three pool-play matches, the sevens squad rebounded to defeat the Massachusetts Maritime Academy and Westfield State in the pouring rain, winning the Shield bracket in the process. Turning first to the main event, the match against Penn began with flyhalf Dawit Workie making a beautiful long pass to Tyler Moragne, which resulted in Dartmouth's first try. This was followed by two first half tries by senior wing Kevin Clark, including a 70-meter solo effort off an interception. Clark's efforts bracketed a try by Captain Neil Greene and another by Robbie Anthony, who received a great offload from Curtis Oberg, completing the first half tally of 33 points. The first half was also marked by strong defense by Dartmouth, including several convincing tackles by big lock Ryan Galloway. The Big Green's defensive intensity continued in the second half as the Penn efforts continued to be stifled, while Clark put an exclamation point on the evening with his third try, ending the scoring at 38-0. Coach Gavin Hickie commented on the victory over Penn stating: “We started off well and got on the front foot early through a couple of tries. We lost some shape in the second half but continued to work hard. Our aim moving forward is to sustain the intensity for a full 80 minutes." Meanwhile, in Springfield, Mass., the twelve DRFC teammates who traveled south for the day battled against the top teams from other schools throughout the northeast. The long day began with a morning match against a strong New England College squad, which ended with freshman Dan Lafranier powering his was through three New England College players with no time remaining to avoid the shutout. The final score of this one lopsided match of the day was 41-5. The boys next returned to the pitch to battle the University of Connecticut, losing 22-14 in a hard-fought contest that was tight throughout. In the final pool-play game, Middlebury College prevailed 31-7, with the DRFC's points coming on a beautiful 70 meter run from Mick Wopinski after taking an offload and flying down the sideline. 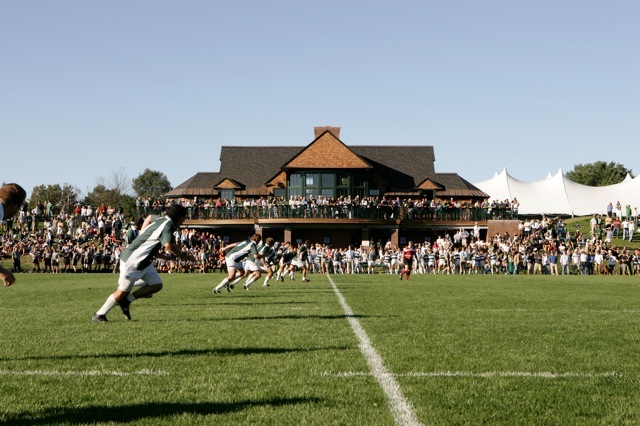 In a testament to the strength of Dartmouth's preliminary pool, New England College eventually advanced to the Cup final, losing to tournament champion and host, American International College. Meanwhile, Middlebury College prevailed in the Plate Final over SUNY Albany. As afternoon turned to evening, the squad took the field against the Massachusetts Maritime Academy for the shield semi-finals. Max Parker '17 and Clay Robbins '14, former high school football teammates at the Menlo School in California, both showed great speed on the wing as they each scored on long solo efforts. This was Clay's first rugby match after a four year career on the football team, and his contribution helped gain the first victory of the day. Andy Suslavich also contributed an important conversion on the way to a 12-7 victory. Several hours later, under the lights in the pouring rain, the DRFC took the field one last time, defeating Westfield State to win the Shield bracket. In this final match, Max Parker was again electrifying as he put the Green on top to stay as the boys walked away with a 12-5 victory and some hardware. The Ivy Cup final between Dartmouth and Harvard will be held on April 5th at Dartmouth. The Varsity Cup will begin April 12th with a home match against Clemson.